Christmas is almost here and that means serving up a holiday dinner to friends and family. You could go with a ham, or you could do something to really wow them. When your guests sit down to the table this year, nothing will delight them quite like tucking into oven roasted penguin. Apologies to my Jewish readers, but I was unable to find out whether or not penguins are kosher. I guess there wasn't a lot of call for that information, wandering a desert all those years ago. 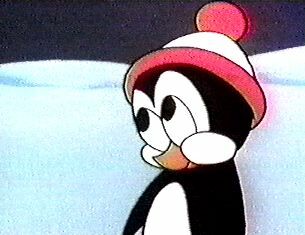 (1) Penguin - Preferably somewhere between an Opus and a Chilly Willy sized bird to accommodate the average sized oven. (2) Onions - Pealed and quartered. It is important to remember to thaw your penguin at least three days before cooking to ensure a bacteria free cook. First thing you need to do is to clean your penguin thoroughly. Salt is the best way to disinfect it. Simply rub salt all over the bird and rinse thoroughly. Pat dry and move to roasting pan. Slice 1 lemon and 1 orange and place under skin of the penguin. Your butcher should have removed the tuxedo for you, so you'll be dealing with a thin layer of skin. Stuff the cavity of the bird with chopped celery and the garlic cloves and quartered onions. Rub olive oil all over the outside of the penguin, add salt and pepper. Place in pre-heated oven at 400 degrees, figuring 20 minutes for every pound of bird. As little tip, you can avoid basting the penguin if you cook it with an aluminum foil tent over it. Just remember to remove half an hour before it's done for browning. To serve, I recommend getting a little playful and serving with bow tie pasta, dressed in a simple basil, parsley and olive oil blend.. Your guests will love the tuxedo reference. Bow tie pasta! Hilarious. Definitely want the tux removed. It's not good eating. I've heard the flippers are quite the delicacy. Accompanied with bow tie pasta - I like it! The kosher conundrum is a good one. If the butcher snips a little more than the tuxedo, it should be fine.